AFAD: REALITY TV SHOW SAFARI FASHION RUNWAY AUDITIONS. If you are lover of Project Runway which am sure most of fashion enthusiast are you will definitely want to be part of AFAD Reality TV Show Safari Fashion Runway. Its one of its kind that will be happening in the country and its a great opportunity for young fashion designers who want to be part of the fashion global scene. 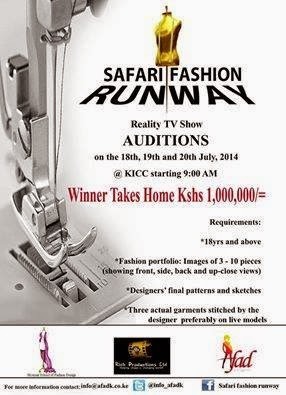 Auditions take part on the 18th, 19th and 20th July 2014 at KICC starting 9:00am. * Fashion Portfolio: Images of 3 - 10 pieces (showing front, side, back, and up-close views). * Designers final patterns and sketches. * Three actual garments stitched by the designer preferably on live models.